Former Chicago Bears Coach, "Iron Mike" has sported his salt-and-pepper mustache for decades. Winning Percentage: .631 while coaching the Bears. Back in the old days, when men were men and your grandpa could smoke in the hospital, NFL and college football players didn’t bother using face masks. Now, on the wake of Concussionpalooza 2010, two products of that bygone era, Joe Paterno and Mike Ditka, think the NFL should go back to open faced combat. "I've been saying for 15 years we ought to get rid of the facemask," Paterno said on his weekly conference call. "Then you go back to shoulder blocking, shoulder tackling, and you wouldn't have all those heroes out there." The Pittsburgh Tribune-Review quotes Paterno as adding, "We used to have one single bar; now we have a weapon…"
"I don't think people would strike with the head as much," Ditka said. "You would learn to strike with the shoulder pads if you didn't have a helmet on your head." I wrote earlier that the NFL should research the idea of getting rid of ALL pads and helmets, the way rugby and Aussie Rules do. I understand where Ditka and Paterno are coming from, but getting rid of the facemask still leaves the REST of the helmet for a defender to crush an oncoming receiver with. That hard outer shell is the much bigger problem. If you played without facemasks but kept the helmet otherwise the same, there’d be 37 broken jaws every week. I doubt the NFL would ever seriously consider such a drastic measure. It would fundamentally alter the game in ways the league can’t foresee, and no owner is going to want to risk that. In their heart of hearts, the NFL doesn’t WANT defenders slowing themselves down. It doesn’t want players stripped bare and playing a more careful brand of football. It wants to keep the speed and aggression the same, only without those pesky injuries that frighten off the old ladies. They want to have their cake and eat it, too. 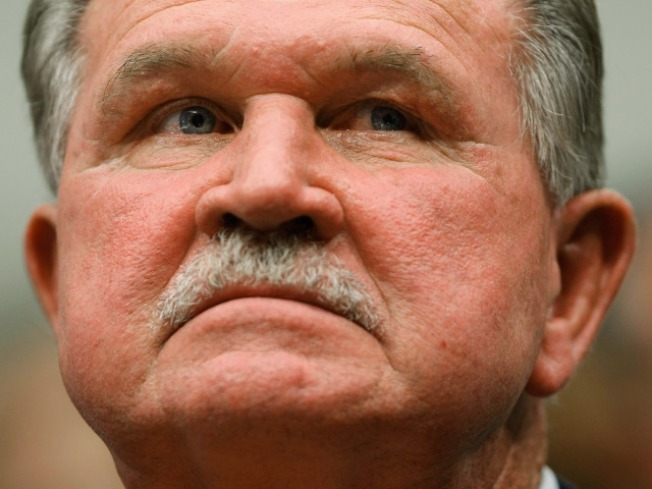 Which means you’ll never see them take Ditka’s advice and go all Craig McTavish on us.